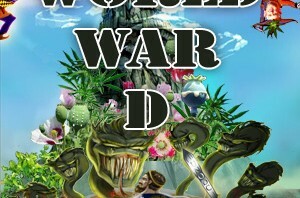 Get a flavor of World War-D when you download this 50 pages excerpt. If everyone knew the truth about how marijuana got locked into the list of schedule 1 drugs, they would be aghast. When all those currently involved in keeping marijuana illegal have to stand up and be counted, and they will, the money, power, and greed seekers will run and hide and those who are simply uneducated about the truth and facts will feel ashamed that they did not seek the truth. The “War on Drugs” represents very close to a trillion dollars of the U.S. Gross Domestic Product and everyone pays in one way or another, it is inescapable. Just having 2.3 million in jail or prison in the U.S. is an international shame since no other country in the world has so many locked up. Thank God we do not kill our own population, however; when it is estimated that close to 80% of those in jail or prison are there due to alcohol or other chemical use related charges, that is truly a sad commentary on our criminal justice system in total. Have not had the pleasure of reading Jeffrey’s book yet but you can count on it, I certainly will as I am in the process of a series of fact based fiction regarding alcohol and other chemical problems. The only way to short circuit the mess is for everyone to grow their own and then if there is any left give it away! The reason that the little guys (people) are willing to pay the high price is because they can’t grow it and if they do try growing it costs a lot and may not produce very much or poor quality. Well I will soon solve this problem with a grow method that will let anyone with a little space and good sunlight to grow 6-7 feet plants that produce 5-7 pounds per plant (EVERYTIME) for under fifty dollars after the first plant. It is fun to grow. Watching it grow, trimming, watering, smoking, doesn’t cost a thing when you love it. If there is anyone interrested in and wants to help me get this almost free method out there let me know at neiderhiserlarry@gmail.com. Just think if you grow it yourself and one plant equals five pounds or more you and all of your friends will have all the meds you will need forever. What this means is no more taxes, cops, judges, courts, lawyers, and more which is a lot of bull —-! Oh and yes it wiil stop all the thousands of KILLINGS along the borders. IT’S THAT SIMPLE!!! With this grow method I have already given away up to seventy five thousand dollars worth at today’s prices already. If you don’t believe it go to http://us2.forward-to-friend1.com/forward/show?u=3ad9c34c3647fc7c1f237dc8f&id=e7abf792c9 and read for yourself. I have given at this dispensery more than once. So there you have it. So if you figure it this way everone could or should I say are going to be knee deep in weed real soon. A worthy psychology research proposal would be to study why otherwise intelligent people (legislators),will not even consider legalizing marijuana. My personal theory is that the legal drugs (alcohol and tobacco) are legal only because they enjoy general support in society,whereas illegal drugs are seen as being used only by undesirables. It will be interesting,however, to see if the desperate need for new tax revenue in many states will overcome this legislative stubbornness,and allow the legal sale and taxation of pot. – WHY do our politicians refuse to legalise or decriminalise marijuana? – illegal drugs is the 2nd most profitable industry, next only to energy. This creates a dependancy on that money – it has been shown that over 100 banks in the USA alone would crash except for the large amounts of illegal drug money flowing through them – not just deposits and economic activity, but actual LAUNDERING. There is $250 Billion per year in illegal drug PROFITS, per year, from the USA market alone. That money has to go somewhere, banks are glad to help out. I have been in the Cannabis Hemp movement since 1968 and find that all these years of study of the history of Cannabis Hemp I find that for one the government has legalized it, then made it illegal, then allowed the Military to grow it during the WWII, then stopped it growing after WWII. However, I have always wondered if God gave us this herb as with all other herbs to eat or use as food [Genesis 1: ver. 29] then why is the government staying involved in this while secretly applying for and holding on to a patent on the CBDs and giving out false untrue information and data about Cannabis Hemp, So I say we should not be seeking legalization, nor Decrimiinalization, because that shall leave the door open for the government to come along later on and make it illegal again down the road for whatever purpose they at the time might come up with. We should be seeking DISGORGEMENT of AL LAWS on Cannabis Hemp [marijuana if you must!] from all law books, as Disgorgement is done when something has been put ini place wrongfully and therein must be torn or ripped out in total and then never to be addressed or discussed or considered for legislation ever again.